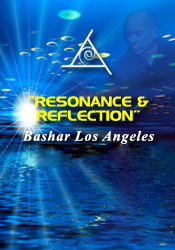 Bashar refines our understanding of the Law of Attraction & Repulsion and takes us to a new level of clarity about how the universe works. Includes a HOLOTOPE Guided Meditation A Transformative Experience of Light, Color and Sound. Q&A Includes: Where will my hybrid children settle down? How are we creating a third reality and reflections with other beings? On emotional relationships. How does time relate to frequency? Am I speaking with myself when I speak with someone who shares an oversoul with me? I don't want to go to work in the morning! Anxiety redefined. On soul-connections. What is "The Big Bang" from your perspective? How can I be more in the now? Do all experiences currently exist? Spirituality and the North Pole.